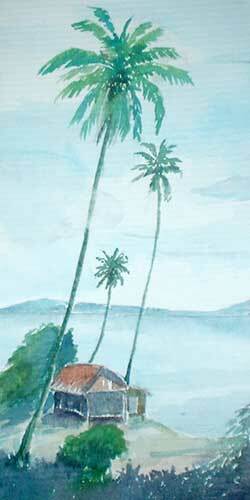 This is a painting of three palm trees completed just moments ago. The paint has dried and I think I have it photographed and uploaded. As you can see, I am trying out the palm fronds and the skies, to see if the colours work out realistically at a distance. This is a miniature painting, about 4.5 inches width by 12 inches (or so) in height. It is a typical scene of a fisherman's house by a cove. The painter is on elevated ground, looking down at an angle. Hey, I love your work! Amazing! I especially like the Sailboat in storm, in a post from March. I don´t think you failed in any part of that one, as you wrote in the text. All the others are extremely good as well, I enjoyed looking through your blog. You left a comment on my blog - if I had ever considered using pill boxes for my watercolors instead of rebuilding my old box, and that´s a good idea. They would be good in many ways, but none of the ones I could get here fits into my pen case. I like to keep it small. But thanks for the idea anyway. Keep up the good work! See ya! You will find it very interesting. Wat a beautiful watercolour drawings you make! !